In this study, technical characteristics of bottom trawl nets commonly used in the Turkish coast of the Aegean Sea are presented. For this aim, recently used overall net plans of 1200 and modified 900 meshes (at footrope level) with cutting shaped are given according to the FAO mode of presentation. Although these nets have different design characteristics, they are similar with two seems and asymmetrical gear design feature as traditionals. In these nets there are no models, and every section of the panels have cutting shape and all of the netting materials used are knotted or braided polyethylene. Though the construction of the bottom trawl net is changed continuously by the fisherman with theirs experience, there is need for further studies to improve performance, efficiency and selectivity of the nets. 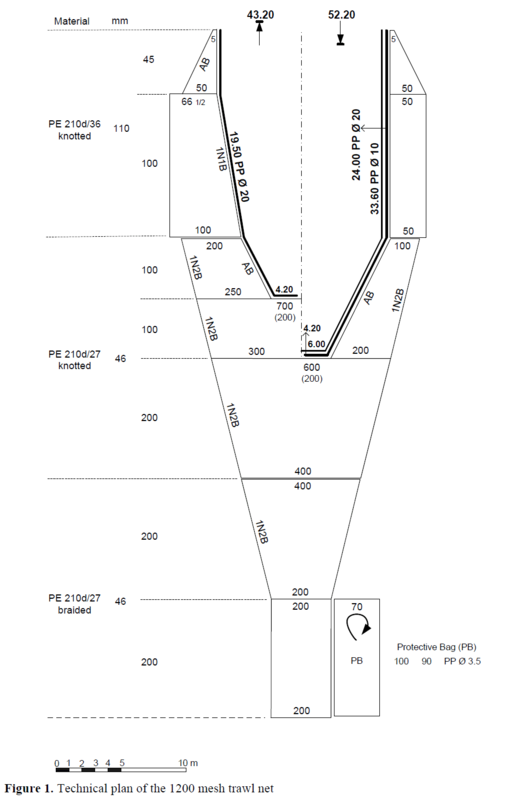 Recently, tailored or with cutting shaped trawl nets which have a 1200 and 900 mesh at footrope level are commonly used with higher percentages (approx. 85%) among the Aegean trawlers (per. com. trawl fishermen). 1200 mesh and bigger sizes trawl nets are used generally in deeper waters to catch commercially important species mainly deep water rose shrimp (Parapenaeus longirostris), hake (Merluccius merluccius) as well as Trachurus spp. Mullidae and Sparidae members are often targeted with 900 mesh and smaller sizes trawl nets. Sizes of these nets are adjusted in width by changing the number of meshes at footrope level and the other parts (Figure 1). 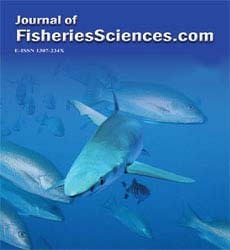 However, fisherman rarely change their net design as seen in Figure 2. Length and the engine power of the trawl vessels that use these nets vary between 20 to 27 m and 400 to 550 hp, respectively. The data for the technical plans of the trawl nets drown here are commercial trawlers presented according to mode of the FAO Catalogues of Fishing Gear Designs (Nédélec, 1975; Nomura and Yamazaki, 1975; FAO, 1978; Brabant and Nédélec, 1984; Nédélec and Prado, 1990). 1200 and 900 mesh bottom trawl nets are built in two panels (upper and lower) and laced together along the two halves. Both panels are made up a number of pieces cut from a length of machine-knit sheet netting. 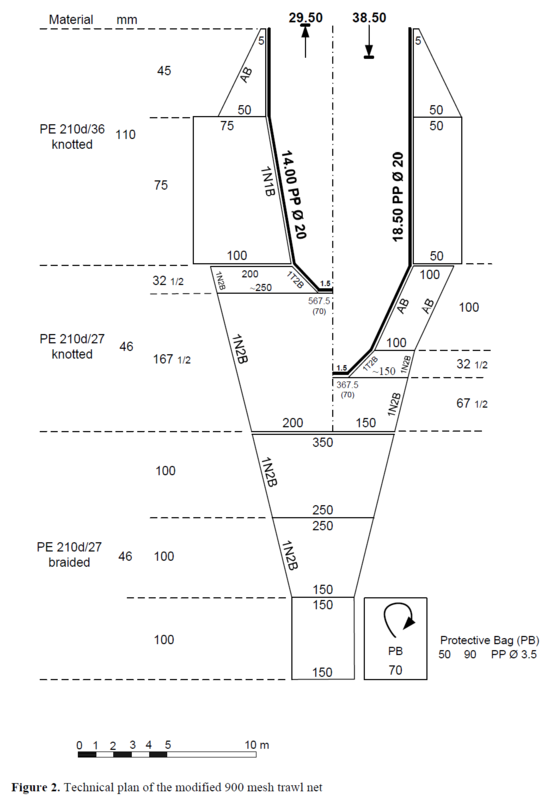 The shape of each piece is shown by meshes in width and depth, together with specifications for mesh size and materials (Figure 1, 2). 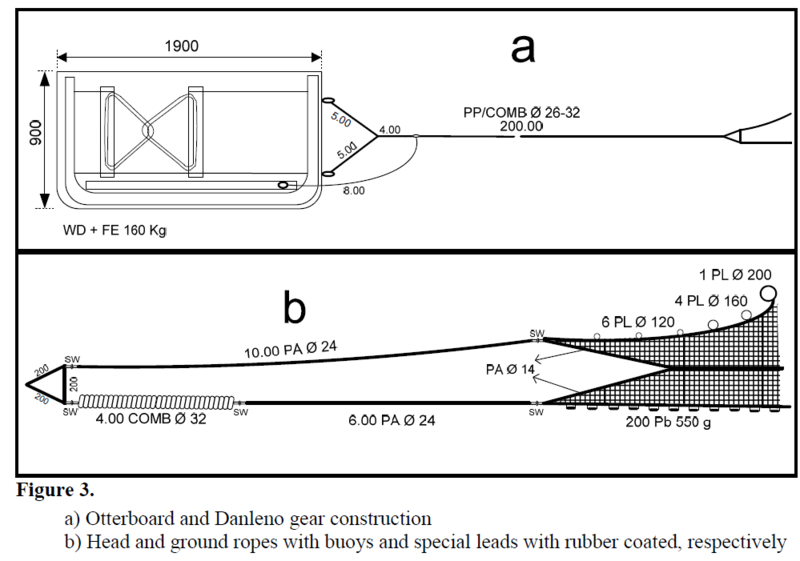 Details of the otter board and Danleno (triangle) gear construction, and head and ground lines of the trawls were given in Figure 3 a and b. Fishermen generally use chain instead of these leads in the ground rope. Five swivels were fitted with the connection between ropes and the net, and in front of the net there were two heavy ropes as called as “dalaman” to provide a strict contact with bottom. Brabant, J.C. and Nédélec, C. 1984. BottomTrawls for Small-scale Fishing. FAO,Fisheries Technical Paper 189, Rome, 40pp. FAO, 1978. FAO Catalogue of Fishing GearDesigns. Fishing News Books Ltd.,Farnham, Surrey,England, 160 pp. Nédélec, C. 1975. FAO Catalogue of Small-Scale Fishing Gear. Fishing News(Books) Ltd., Surrey, England, 191 pp. Nomura, M. and Yamazaki, T. 1975. FishingTechniques. Japan InternationalCooperation Agency, Tokyo, pp 39-125. Nédélec, C. and Prado, J., 1990. Definition andClassification of Fishing Gear Categories. FAO, Fisheries Technical Paper 222,Rev. 1, Rome, 92 pp.